Here’s what’s on this page! 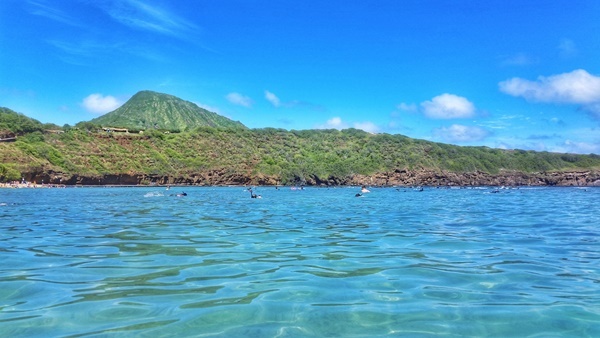 The Hanauma Bay Nature Preserve is possibly the most famous place for snorkeling on Oahu. A visit to Hanauma Bay will also be a visit to the first marine life conservation district in Hawaii! It is one of three of such districts on Oahu. 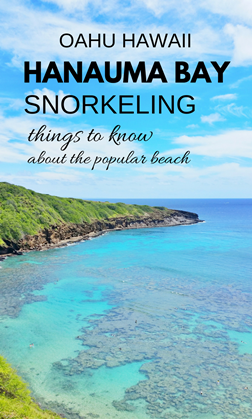 With visits to this beach near Waikiki and this beach on the North Shore, you can get in some snorkeling at the other two marine life conservation districts on Oahu, as well as explore other parts of the island! Learn more about what it means to be a Marine Life Conservation District from the Hawaii Department of Aquatic Resources. Remember that things can change, and this information is as of spring 2017! It is officially open from 6:00am to 7:00pm during the summer, which is considered to be from Memorial Day weekend at the end of May to Labor Day weekend at the beginning of September. Otherwise, the opening hours are 6:00am to 6:00pm. It is closed every Tuesday. It is also closed on Christmas and New Year’s Day. The cost to enter Hanauma Bay is $7.50 for non-residents that is valid for a single day. Age 12 and under are free! Can you rent snorkeling gear here? Snorkeling gear is available for rent at Hanauma Bay. See prices for snorkel rental here. If you think you’ll be snorkeling at least twice during your stay in Hawaii, then it may be worth purchasing your own snorkeling set before your trip. The price of a beginner’s snorkeling set like one of these will typically offset the cost of renting snorkeling gear two times. You can also find snorkeling sets that include a mask, snorkel, and fins. Is this a kid-friendly snorkeling spot? 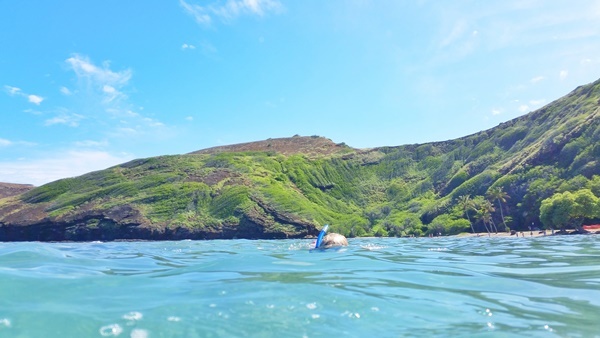 In general, Hanauma Bay has kid-friendly snorkeling. You will see tons of families and kids here. More here on snorkeling with kids. This also makes it a beginner-friendly snorkeling spot on Oahu too. More here on snorkeling when you can’t swim. More beginner-friendly snorkeling spots on Oahu. That said, it is the ocean, and there is the risk of rip currents, and there are signs posted around about it! There is a lifeguard at Hanauma Bay. Also consider going with this sunscreen or this sunscreen to be more environmentally-friendly to the coral reef that attract the colorful fish. There are restrooms, showers to rinse off salt water and sand, and a snack bar. There are also lockers that you can pay for, around $10. 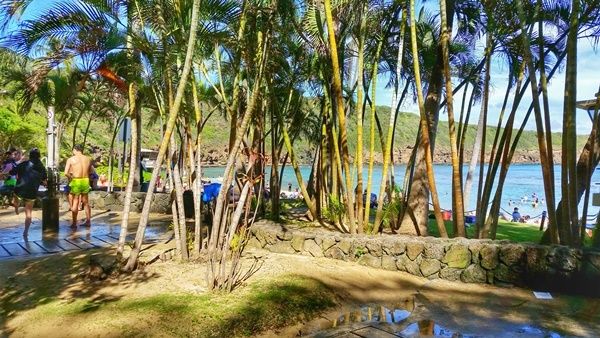 List of Hanauma Bay prices here. What is the video that you need to watch in order to go snorkeling? 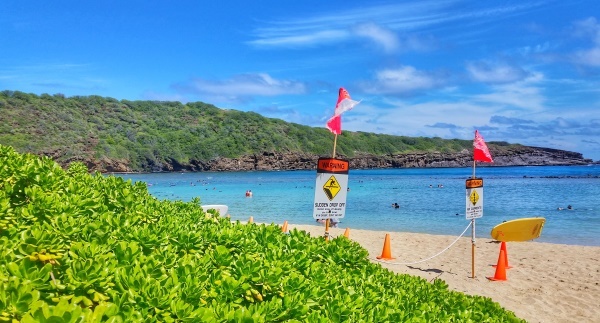 Before you are allowed to access the bay, you will be required to watch an educational video about the nature preserve and best practices for snorkeling at Hanauma Bay. If you think there’s even a chance that you’ll be back to Hawaii within a year, sign your name up on the list as having watched the video. This way, the next time you visit Hanauma Bay, you won’t have to spend time waiting for the video to start and watch it again. Your “credit” for watching the video lasts a year. What is the Hanauma Bay shuttle or tram? Once it’s time to go down to the bay, it’s about a 5 minute walk. Instead of walking, there is also a shuttle that can take you down to Hanauma Bay, as well as back up. The cost of this is $1 on the way down, and $1.25 to take it back up. What should you pack for snorkeling at Hanauma Bay? Here’s the quick list of things you may want to add to your Hanauma Bay packing list for your snorkeling trip! For a more in-depth look, see what to wear snorkeling. Is it easy to get to Hanauma Bay from Waikiki? 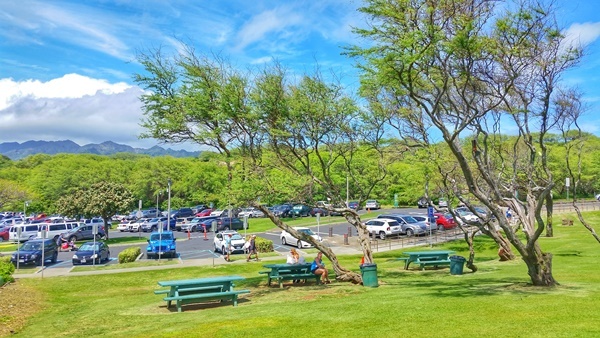 It is pretty easy to get to Hanauma Bay, whether you’re driving or taking the bus! If you’re renting a car on Oahu, it’s a pretty straight shot from Waikiki. It’s about a 30 minute drive. If you’re taking the bus to get around Oahu, it’s also pretty easy because it doesn’t require any bus transfers. It’s about 45 minutes on the bus. 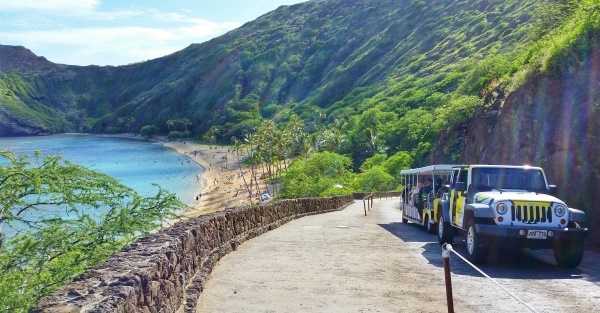 Here’s more info on taking the bus to Hanauma Bay from Waikiki. The fee at the Hanauma Bay parking lot is $1. If the parking lot is full, you will be turned away. What can you do when the parking lot is full? If this happens to you and you are turned away, as an alternative, head on over to the Koko Head Hike for a more strenuous hike or Makapuu Lighthouse Trail for a little bit easier hike to pass time. Then when you’re done with the trail, you can head back to Hanauma Bay to see if the parking situation has improved. If it hasn’t, do the other hike! 😉 The Makapuu Lighthouse Trail can be especially good to do if you’ll be in Oahu during whale season! Or, if you insist on snorkeling at Hanauma Bay 😉 give a try to another parking lot near Hanauma Bay. 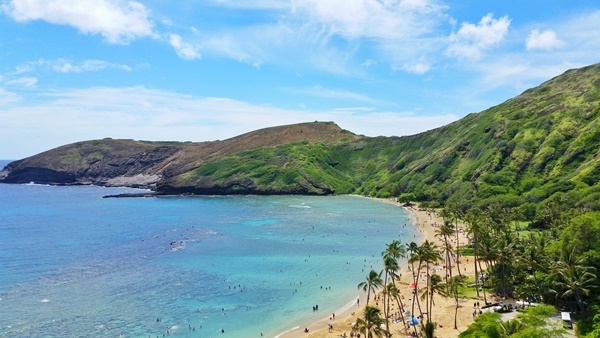 To learn more and make sure you have updated information about Hanauma Bay, you can get info from the City of Honolulu and Hawaii Department of Aquatic Resources. Remember to respect the ocean and marine life! Have FUN snorkeling at Hanauma Bay! What activities are near Hanauma Bay? Planning your main activity of snorkeling at Hanauma Bay can make for a great day! 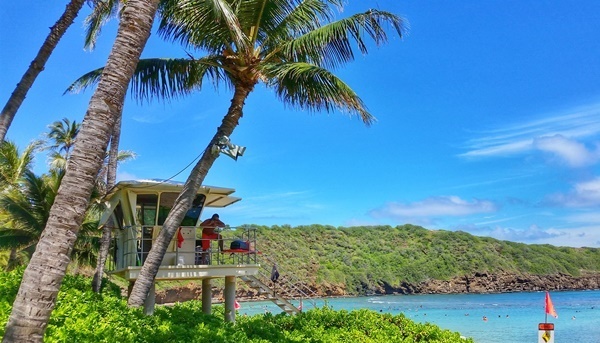 That said, if you are looking for things to do that are near Hanauma Bay to add an extra activity into your day’s itinerary, here are some ideas that you can consider that won’t eat up too much transportation time, although there is always the chance you will run into delays! If you want to get in two (or more!) activities in on a single day, it is best to get your day started early! This is even more so if you’re using public transportation to get around Oahu. Waikiki snorkeling: Queens Beach – This beach is about a 30 minute drive to Waikiki. If you time it right, this is another activity that you can get from Hanauma Bay to Queens Beach in under an hour by bus. Lanikai Beach – This beach is about a 40 minute drive. The Lanikai Pillbox Hike is located right nearby for a hiking and snorkeling combo! Koko Head Hike – This trail is just across the street from Hanauma Bay. If you have no car, this would be the best add-on activity since it is right nearby… if you are prepared for some strenuous exercise! And if you don’t mind carrying your snorkeling gear on the trail. The walk there isn’t strenuous, but you may think the trail is. If you’re doing this hike to go along with a good swimming or snorkeling session, you want to make sure that you bring plenty of drinks and snacks along! The Koko Head Trail on its own is enough to give you a good workout as it is basically a stair climbing session on the way up. Makapuu Lighthouse Trail – This trail is about a 10 minute drive. If you’re bussing it, this would be another good add-on activity to Hanauma Bay if you’re looking for something a little calmer than stair climbing! The bus ride is also about a 10 minute ride, but you need to factor in the time waiting for the bus. Lanikai Pillbox Hike – This trail is about a 40 minute drive. As mentioned above, Lanikai Beach is right near this hike to get in some extra snorkeling after your hike! Diamond Head Crater Trail – This trail is about a 20 minute drive. To plan other days of your Hawaii vacation, be sure to see Oahu hikes and Oahu snorkeling!